Outdoor enthusiasts are being invited to help crowdfund repairs to some of England and Wales’s most used upland paths. The British Mountaineering Council’s Mend Our Mountains scheme will launch this month and will enable mountain lovers to stump up cash for their favoured project. Routes on England and Wales’s highest mountains feature in the list of projects open to donations, along with heavily used sections of other popular paths. The BMC said it hopes to raise more than £100,000 and has enlisted the support of Everest summiteers Sir Chris Bonington and Doug Scott and television walking star Julia Bradbury. Paths on Snowdon and Scafell Pike will benefit from the donations, along with routes on Ingleborough, Kinder Scout and part of the Brecon Beacons Horseshoe, as well as vital repairs to moorland on Dartmoor, Exmoor and the North York Moors. The BMC said donors will receive a reward in return, including personal experiences donated by outdoor personalities and mountaineers such as Sir Chris and others. Everyone who makes a donation will have a choice of either giving their money to an individual project featured in the campaign or to an overall total which will be split between the eight projects. Many of the projects, such as Snowdon’s Watkin Path and Kinder Scout’s Ringing Roger, will not go ahead if they do not reach their Mend Our Mountains target. Carey Davies, BMC hillwalking officer and joint Mend Our Mountains campaign co-ordinator, said: “More people experiencing the outdoors is good news, improving our collective health, enriching our culture, encouraging engagement with nature, and keeping rural economies alive. “But it puts pressure on the landscape. “One of the biggest and most expensive problems to manage is erosion. In the past in popular places like the Yorkshire Dales, some of these scars caused by countless feet have grown to up to 30m, motorways of damage as wide as parts of the M1. “To manage this problem needs effective intervention, usually through the construction of paths, which help to heal the mountain landscape and protect habitats and wildlife. But they are not cheap to construct. And in these straitened times, where austerity is the mantra, money is in increasingly short supply. 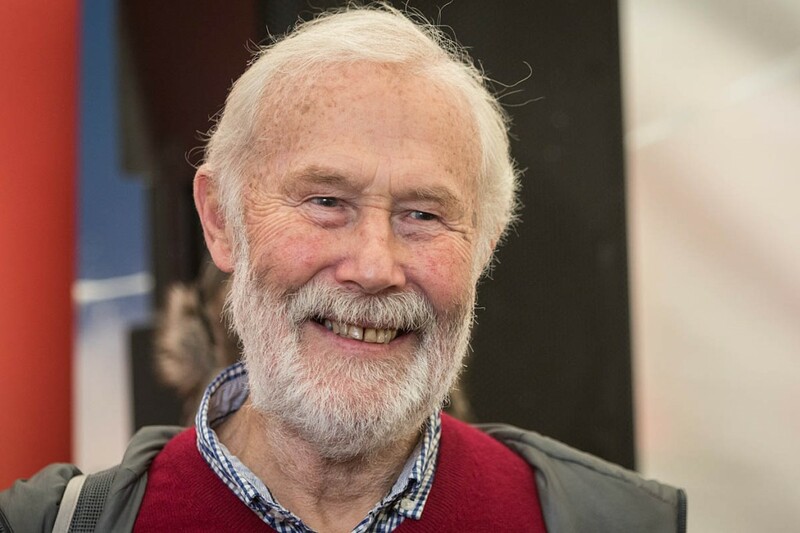 Sir Chris Bonington said: “Footpath work is essential to look after our mountains. Without it many routes in places like the Lake District would become huge scars or rivers of scree. Snowdon’s Watkin Path. The highest mountain in Wales is the most popular mountain in Britain, attracting almost half a million visitors a year. The section at the top of the Watkin Path just below the summit is notoriously eroded, but without the success of the Mend Our Mountains campaign it will not get repaired. 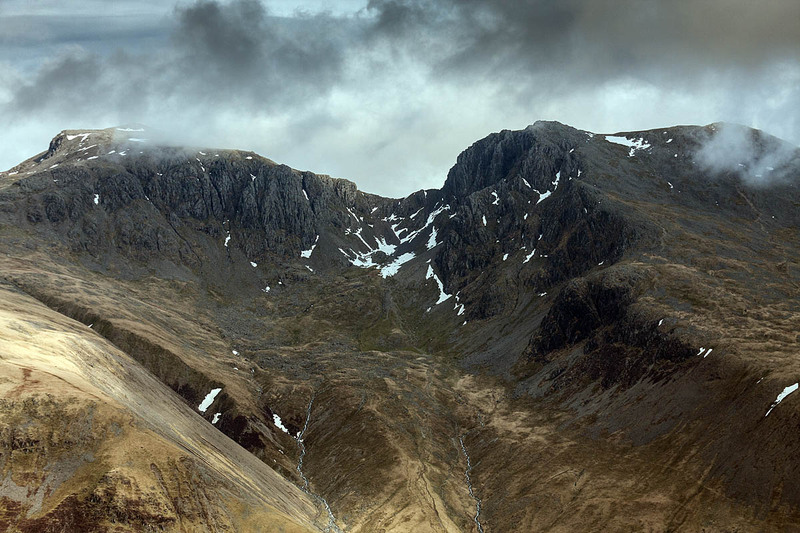 Scafell Pike, the most direct route to the summit of England’s highest mountain. About 100,000 people walk this heavily scarred path ever year, many of them taking part in the national Three Peaks Challenge. Keeping the Lake District’s paths in good shape is a constant challenge, especially after the devastating winter floods. Kinder Scout, a heavily damaged path below Ringing Roger. The route is on the hill famous for the 1932 Kinder Scout Mass Trespass, which helped create the access freedoms we enjoy today. Ingleborough, the path below the summit of Ingleborough known as the Swine Tail. It is on the route of the Yorkshire Three Peaks Challenge, which is conservatively estimated to raise £5m annually for charity, but this path must withstand 60,000 pairs of feet a year to support all those efforts. 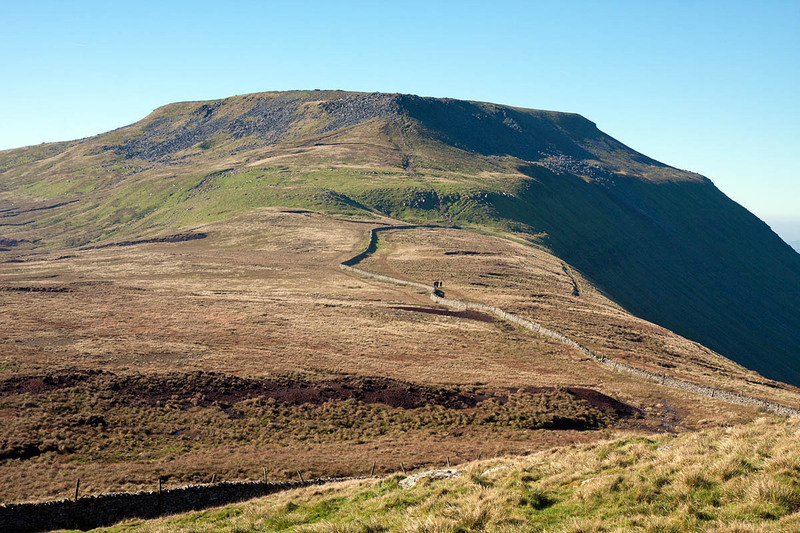 It costs £28 per metre to maintain the 42km of the Three Peaks. Brecon Beacons Horseshoe, the path above the Neuadd Reservoir. Part of a circular walk that takes in the highest peak in southern Britain, Pen y Fan, but the path has deteriorated badly over the past 20 years. Path repair in the most remote parts of the Brecon Beacons can cost up to £170 per metre. Lyke Wake Walk in the North York Moors. As well as damaging the sensitive surrounding moorland, the erosion on this section of path near the Yorkshire coast at Burn Howe Rigg threatens to undermine ancient monuments, including possibly the oldest stone cross in northern England. Dartmoor, a spectacular ancient path in the high reaches of Dartmoor. Used by 18,000 walkers and 6,000 mountain bikers, but with erosion that threatens the precious peat bog surrounding it. This is a 4km long project which will cost about £40 to £50 per metre. Exmoor, Long Chains Combe. An ancient trading route through one of the most remote parts of Exmoor, the path has become badly eroded through a combination of high use and recent heavy rainfall. Steve Hastie, the Yorkshire Dales National Park Authority’s Three Peaks manager, said the BMC campaign recognised that everyone had a responsibility to help in the management of some of the busiest paths in the country. “This is a fantastic chance for anyone and everyone who has walked to the top of Ingleborough or who just loves the area to generate vital funds to help keep the paths in A1 shape for the hundreds of thousands of people who use them ever year,” he said. The online Mend Our Mountains crowdfunding site will go live from 14 March.